Why Should My Employer Pay? Pursuing a usRAP project? Coding road attributes from photo/video data is a key first step. usRAP Coding: A Complete Course on Data Preparation is one of a series of courses developed in a partnership between Iowa State University ELO and usRAP. This course covers the process of preparing the data that is needed by the ViDA software in order to generate star ratings and safer roads investment plans. Participants will be introduced to the usRAP Coding Manual and coding tool and will be given thorough overviews of the 50+ road attributes analyzed by the usRAP protocols. This course is also appropriate for coding supervisors. This course is intended for individuals and/or teams who have been selected to serve as coders on a new or existing usRAP project. Persons who will be supervising coding teams should also take this course and be familiar with its content. There is no prerequisite other than this training course to become a usRAP coder, though some background in traffic engineering or similar field may be advantageous. Coding teams may consist of undergraduate and graduate students, technicians, consultants, or others who have received this training. The course begins the date we receive your registration. All course work must be completed within 30 days of that date. Approximate time to complete this course is 7.5 hours. Once your registration information is received, we will send you your username and password to access the course site. Complete the learning modules at your own pace. For each learning module, you will watch a lecture video with PDF handouts. Upon completion of the assessments in Module 5 and the course, you will receive 0.75 CEUs (7.5 PDHs) by ordering your credits from our Web site. Issuing cost of CEUs is being waived by RSF (Reg. $25). Please request your CEUs through the course site. There are four assessments within module 5 of the course that you must pass in order to receive PDH (CEU) credits. You must score at least an 80% or above on each assessment to receive credit for the course. You are allowed 3 attempts to pass each assessment, with each attempt having a 1 hour time limitation. You will be provided with a PDF of the Coding Manual, video presentations, learning activities, and PDF handouts. This course has no additional textbook aside from the Coding Manual. Contact pd.elo@iastate.edu or call 1-800-854-1675 for more information. Zach has over two decades of professional experience in transportation engineering, working primarily in the areas of safety, maintenance operations, asset management, and planning. Zach has supported usRAP since its inception and participated in several iRAP efforts. 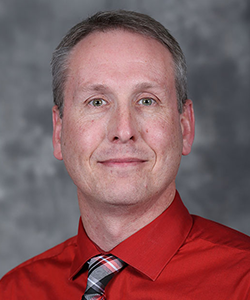 Zach also serves as a Director of the Center for Weather Impacts on Mobility and Safety (CWIMS) at the Institute for Transportation (InTrans) at Iowa State University. 1328 Howe Hall, 537 Bissell Rd Ames, Iowa, 50011 U.S.A.